In other words, what you do in this life will affect your next life. You will either receive good or bad karma in the next life depending on the way that you live. The Bible does indeed talk about reaping and sowing. Notice that these passages are referring to this life. They have nothing to do with reincarnation. Our actions in this life do affect us. You will live with the results of your actions. There are consequences for your choices. If you choose to reject Christ you will not inherit the Kingdom. Sometimes God does get revenge on behalf of His children. Sometimes God does bless those who have sown righteousness and He does curse those who have sown wickedness. 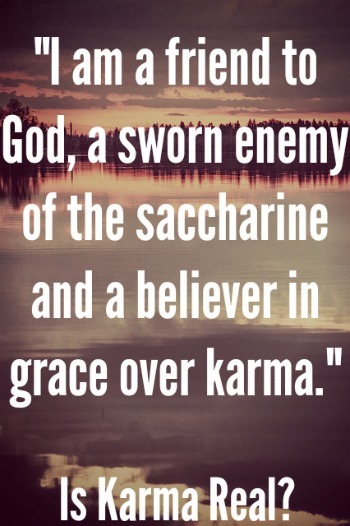 Once again karma is not biblical but reaping and sowing is. Galatians 6:9-10 Let us not lose heart in doing good, for in due time we will reap if we do not grow weary. So then, while we have opportunity, let us do good to all people, and especially to those who are of the household of the faith. Hosea 8:7 For they sow the wind And they reap the whirlwind. The standing grain has no heads; It yields no grain. Should it yield, strangers would swallow it up. Proverbs 20:22 Don’t ever say, “I’ll get you for that!” Wait for GOD; he’ll settle the score. Proverbs 11:25-27 The liberal soul shall be made fat: and he that watereth shall be watered also himself. He that withholdeth corn, the people shall curse him: but blessing shall be upon the head of him that selleth it. He that diligently seeketh good procureth favour: but he that seeketh mischief, it shall come unto him. Scripture says that we will all die once and then we will be judged. This clearly does not support karma and reincarnation. You get one chance and one chance only. After you die, you are either going to go to Hell or you are going to go to Heaven. Hebrews 9:27 Just as people are destined to die once, and after that to face judgment. Hebrews 10:27 but only a fearful expectation of judgment and raging fire that will consume all adversaries. Matthew 25:46 And these will go away into eternal punishment, but the righteous into eternal life. With karma you control your salvation which is ludicrous. Karma teaches that if you are good you can expect to have a pleasant life in your next life. One of the problems is that you are not good. You are a sinner in the eyes of God. Even our conscience tells us when we do wrong and sin. You have thought and done things so wicked that you wouldn’t tell your closest friends. You have lied, stolen, lusted (adultery in God’s eyes), hated (murder in God’s eyes), said God’s name in vain, envied, and more. These are just a few sins. The people who do such sins as lie, steal, hate, blaspheme God, etc. are not considered good. How can a bad person do enough good to save him from judgment? How about the bad that he continues to do and the bad he has done? Who determines the amount of goodness needed? Karma opens the door for a lot of problems. God pours out His grace upon us even though we don’t deserve it. Karma teaches that you can basically earn favor, but that would be bribing the judge. Isaiah 64:6 says, “all our righteous acts are like filthy rags.” If God is good He cannot acquit the wicked. How can He overlook your sins? Karma does nothing to get rid of the sin problem. What good judge acquits a person that has committed a crime? God would be just and loving if He sent us to Hell for eternity. You don’t have the ability to save yourself. It is God alone who saves. Karma teaches that you get what you deserve, but the Bible teaches us that you deserve Hell. You deserve the worst, but in Christianity Jesus got what you and I deserve. Jesus the God-Man lived the life that you and I could not live. Jesus is God in the flesh. God had to satisfy the requirements on the cross. Only God can forgive our iniquity. Jesus reconciled us to the Father. Through Christ we have been made new creatures. We must repent and trust in the blood of Christ. Ephesians 2:8-9 For you are saved by grace through faith, and this is not from yourselves; it is God’s gift not from works, so that no one can boast. Proverbs 17:15 Acquitting the guilty and condemning the innocent— the LORD detests them both. Now that you know that karma is not real what are you going to do about it? If you die today where are you going Heaven or Hell? This is serious. Please take a few minutes to learn how to be saved.